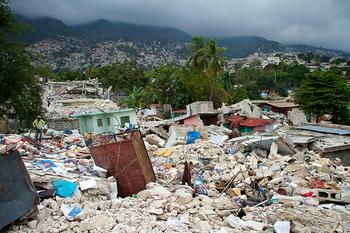 PORT-AU-PRINCE, Haiti, June 7, 2010 (ENS) – Spend two hours in Port-au-Prince, Haiti’s ramshackle capital, and the likelihood is that at least one will be passed in a traffic jam. Already poorly maintained, the city’s infrastructure was hopelessly damaged by the January earthquake. Piles of concrete rubble from destroyed buildings block the streets and turn the twisting, congested roads into a nightmare of honking horns and exhaust fumes. Look more closely and you’ll see that some of what looks like rubble blocking streets and intersections is actually garbage, swept into five-foot or ten-foot tall piles of stinking refuse that are magnets for flies, rats and feral dogs. With the start of the rainy season, this rubbish is frequently swept into canals, blocking the stormwater runoff, breeding disease-carrying mosquitoes and flooding the streets. Venture into Carrefour-Feuilles, one of Port-au-Prince’s poorest suburbs and you’ll notice something unusual. Small-scale trash still litters the sidewalks and gutters, but the huge piles of garbage are few and far between. Instead, there are large blue waste containers every few blocks. 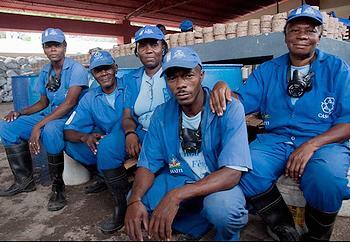 Gangs of men and women in blue overalls patrol the streets, scooping rubbish into sacks. 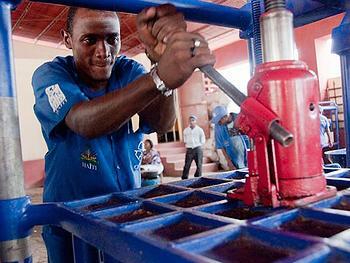 The bins and street cleaning groups are the products of a long-running project called CASCAF – in French, the Sanitation Action Committee of Carrefour-Feuilles – which not only gathers rubbish from the streets, but also recycles it into environmentally-friendly cooking briquettes. “It’s a very clever idea that this community has come up with, because it has not one, but three benefits,” says Liliana Nicolini, an energetic Brazilian who provides technical advice to the project on behalf of the United Nations Development Program. “One, it provides employment to over 300 families. Two, it keeps the streets clear of rubbish. And three, they make these briquettes, which reduce the use of charcoal,” she said. The CASCAP factory, tucked in against one of the area’s steep ridges, is a sweet-smelling and well-organized space, with huge color-coded containers labeled paper, plastic and compost. 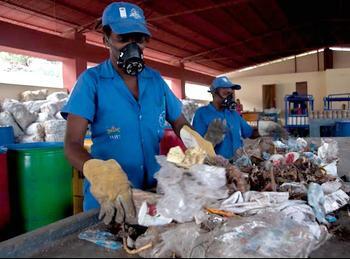 Inside, more blue-overalled workers wearing breathing masks and heavy gloves sort through the rubbish in the triage area. Plastic and metal is sold on to recyclers, organic waste is put aside for compost, and paper and cardboard become the cooking briquettes. It’s a deliberately low-tech and simple process – the paper and card are soaked in barrels of water for two days, then pounded with a giant pestle and mortar. The resulting mush is tipped into wheelbarrows and mixed by hand with sawdust. The next step is to pack it into plastic drainpipes with holes drilled in the sides. These home-made molds are loaded onto a machine which consists of a hydraulic truck tire jack bolted onto a frame holding 25 metal cylinders. As the cylinders are lowered into the molds using the jack, the water is squeezed out of the holes in the sides. 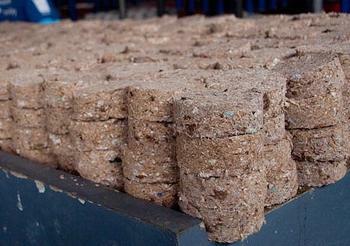 All that remains is to dry the resulting compacted rolls of fuel in the sun and cut them into neat, circular briquettes. The briquette press was designed with input from the factory staff and built in local workshops. Using dried briquettes in a simple metal stove, one of the workers, Melanie Germain, whips up a staff lunch of beans and rice in impressively fast time. “Our briquettes burn fast at first in order to boil the water,” she explains. “Then they burn slower to simmer it the way we like to cook our food.” Most Haitians cook using charcoal, which is not only harmful to health but also relatively expensive in a country where 78 percent of people live on less than $2 a day. Using briquettes, the cost of cooking a meal is 22 gourdes (56c), as compared with 50 gourdes ($1.40) using charcoal. Then there are the environmental benefits. Haiti’s deforested countryside is depleted further when rural inhabitants cut down their few remaining trees to sell for charcoal. Reducing the scale of the charcoal industry is vital to keep trees in the ground and return fertility to barren soil. An unexpected side effect of cleaning the streets of rubbish has been clearing them of crime as well. It is estimated that 50 percent of the buildings in Carrefour-Feuilles collapsed entirely during the earthquake, leaving thousands homeless and jobless. Before the advent of the project, Carrefour-Feuilles was a hotbed of gang activity, with small-time crime the only possible means of income for most inhabitants. Today, the factory and street cleaning teams employ 380 people. To spread the benefits as widely as possible, there’s a rule that each worker must come from a different family, and that at least half of them must be women. This puts earning power in the hands of responsible household leaders and ensures that the wages of $6 a day go directly towards feeding and educating children. It’s estimated that the effects of the project touch over 150,000 people, and violence has dropped away as a result. Lynette Sejour, who has worked at the factory since its launch three years ago, says not only is she now able to send all seven of her children to school, but she feels safer as well. “People who once would have joined gangs now know they can do better on the street cleaning teams,” she says. The market for briquettes is expanding slowly, with the project running publicity campaigns and training local sales agents to spread the word about the benefits of the new fuel. “It was slow at first, but people around here are getting the idea now,” says Heblenette Polycarpe, a supervisor at the factory. There’s also a healthy market among the thousands of nongovernmental organizations working in Haiti. The World Food Program, for example, buys briquettes in bulk, as do educational charities that need to cook for large numbers of hungry schoolchildren. The CASCAF project is jointly funded by the UN Development Program, a Haitian bank and the governments of India, Brazil and South Africa. Future plans for the project include a composting center to produce fertilizer and a public marketplace to help street vendors sell their wares.